Famous Somaliland singer Sahra Halgan is determined to revive the country’s art scene. By opening up the Hiddo Dhawr Center in the capital Hargeisa, she hopes to draw on Somaliland’s rich culture and long tradition in music and poetry. Halgan’s cultural centre is already a raving success, which is not only popular among local residents, but also attracts the attention of foreign visitors. In Somalia, political violence in recent years has stifled local culture. But citizens are rallying to restore the country's rich traditions of music and poetry. We meet one of them now – a musician who has created one of the hottest venues on the Horn of Africa. Welcome to this nation of poets and to the Hiddo Dhawr Center in Hargeisa, Somaliland's capital. Here, lovers of traditional Somali music gather to celebrate their shared culture, surrounded by traditional chairs and even thatched houses. It's the brainchild of Sahra Halgan. 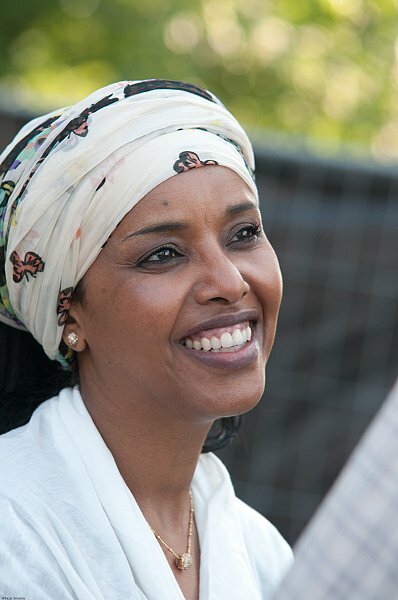 A legendary Somali musician, her mission is to promote Somali culture while providing entertainment. "We boast a rich culture in arts, poetry, and music. It has brought us together and created love among the Somali people. We play music using guitars and not machines. This rich culture is what we want to bring back. We want the culture to remain intact and not be overtaken by technology," Halgan said. The centre is mostly booked for the weekend. Abdi Yusuf is one of the visitors here. A lover of Somali culture, he comes here with his friends every weekend. "Rebuilding the culture of the Somali people because it's been lost, and we turned it into a musical one. Now we use traditional guitars. We are very happy to come to Hiddo Dhawr and to have this kind of entertainment, and it's very important for foreigners to come here and see our culture," said Yusuf. It's a culture that stretches back into the ages, and the Hiddo Dhawr Center here in Hargeisa wants that beautiful culture preserved, nurtured into something that can be used to portray the richness of the Somali cultural heritage. The centre also draws in foreign researchers, including frequent visitor Christina Wolner. "I come to Hiddo Dhawr very often, because it's the only place you can see live music in Hargeisa. I like coming here for the same reason that many of the people that I've talked to here like coming. It's a place you can relax, you can be yourself. There is a different kind of energy both from the performers and the audience," Wolner said. Throughout the nation, a campaign is underway to revive Somalilands' rich culture – a culture that has experienced many challenges due to conflict and instability.